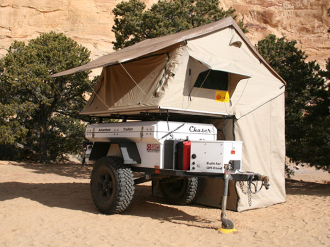 The Series 3 Globe Trotter Roof Tent is the ultimate in Roof Tent Luxury. Eezi-Awn has created a spacious two level tent, combining a low platform mounting height with a 6'6" walk in door. Room for 4 adults to sleep comfortably. This tent is preferably supported by at least 3 load bars.